Bloomingdale’s is one of the most-loved fashion icons in America. In fact, no other store can match its buzz and cachet. It is internationally renowned and responsible for launching countless designers. And Bloomingdale’s constantly reinvents the department store experience with everything from designer merchandise, to exciting visual presentations to one-of-a-kind events. 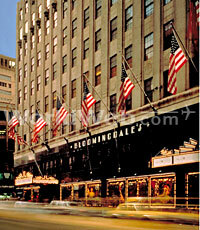 Nicknamed Bloomie’s by its loyal customers in the 1970s, Bloomingdale’s plays host to dozens of celebrities each year and welcomes tourists from around the world to its international Visitor’s Center in New York. Currently, Bloomingdale’s operates 40 stores in 12 states and is the only nationwide full-line upscale department store in the United States. Its operations present a wide range of job and career opportunities, which you can explore at BloomingdalesJOBS.com. Each year, Bloomingdale's and its employees raise funds and volunteer for numerous worthy causes through our Partners in Time program. We support the communities we serve through our Bag Hunger food drive, our Earning for Learning education program, AIDS walks, National Mentoring Month, and other local causes through the United Way. Get more details about Bloomingdale's culture and our commitment to the community at BloomingdalesJOBS.com. Diversity, collaboration and inclusion are important to Bloomingdale’s. Knowledge and experience from many backgrounds play valuable roles in our decision-making. Women represent 75% of Bloomingdale's workforce and more than 68% of management-level executives. Racial minorities total more than 50% of our workforce and 29% of management. Visit BloomingdalesJOBS.com to read more about our dedication to diversity. Bloomingdale's is a division of Macy’s, Inc. – America’s premiere fashion retailer with stores coast-to-coast, as well as in Puerto Rico and Guam. We offer a broad array of job opportunities where you can try various work experiences, often in different places, and even pursue several different careers – all within the same company. Whether you want to pursue a career at our headquarters in New York or at one of our stores throughout the nation, begin your search at BloomingdalesJOBS.com.